Lei Xin, Liang-Hao Hu, and Zhao-Shen Li from Changhai Hospital, The Second Military Medical University, Shanghai, China describe their article published in the October issue of GIE. This study evaluated the ERCP development in the largest developing country, China, between 2006 and 2012, when the ERCP volume in developed countries decreased. In developed countries, the role of ERCP has changed from a diagnostic to a therapeutic modality, and the total volume has decreased. However, reliable data on the trend of ERCP growth in developing countries are sparse, especially in China and other emerging market countries where ERCP is still a relatively new and rising technique. 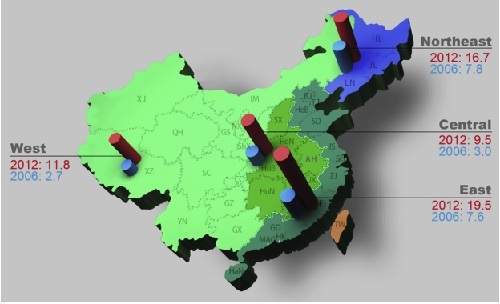 Our previous national survey in 2007 suggested that ERCP use needs substantial improvement in China, so we conducted another survey in 2013 to evaluate the development over 6 years and to investigate the potential problems. Figure 1: ERCP rates (the number of ERCP procedures per 100,000 inhabitants) of China and developed countries. From 2006 to 2012, ERCP has developed considerably in China, although the ERCP rate in China (14.4 per 100,000 inhabitants) in 2012 was still much lower than that in developed countries. The number of hospitals performing ERCP in China increased from 470 to 1156, while the total ERCP volume increased from 63,787 to 195,643. There was still significant imbalance between different regions (1.3-99.1 per 100,000 inhabitants). The post-ERCP adverse event rate in 2012 was comparable between hospitals in terms of volume (>500 or Our survey showed that the median volume of the 686 hospitals that started ERCP after 2006 was 31.5 (IQR, 11-82). Despite low annual volume, the hospitals starting ERCP after 2006 have acceptable adverse event rates and will be promising and important sources of ERCP development in China. 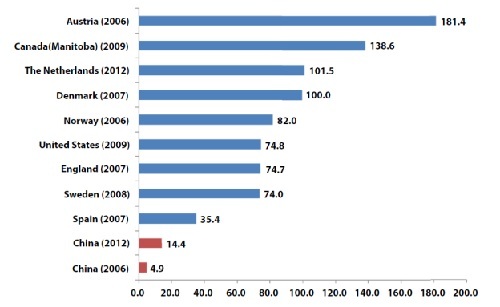 Figure 2: Development of ERCP rate (the number of ERCP procedures per 100,000 inhabitants) in the 31 provincial regions of mainland China between 2006 and 2012.